Socio Economic Development (SED) Bank, which has its headquarters in Killinochchi, opened its first branch in the east of the island, Sunday. The General Manager of the SED Bank Mr.S.Sriskandarajah, declared opened the branch in Kadatkaraichcenai village in Muttur east in Trincomalee district. The General Manager Bank, Mr.Sriskandarajah speaking at the event said that the SED bank was established in 1997 from the funds of the Tamil Rehabilitation Organization (TRO) under Rapid Rehabilitation Development Service project at a time when the people of Vanni region were unable to save for their children's future. Now more than eleven thousand people have opened saving accounts in the bank. The SED bank has provided about fifty five million rupees as loans to saving account holders, Mr.Sriskandarajah revealed. SED Bank General Manager Mr.Sriskandarajah declared open the SED bank branch in Muttur by cutting the ribbon. Mr.Sriskandarajah said there has been a decline in the saving habit among the middle class people as a result of the war and adverse economic conditions in the northeast province. "In order to instill the habit in the minds of our people the SED Bank has introduced several saving programmes. One of the programmes is to open accounts for each child in pre-school days and to provide a saving box free to it. When the box becomes full, the amount a child had put in the box will be credited to his or her saving account book. In addition the TRO will contribute to each child saving account on the International Children Day a sum equivalent to 25 percent of the amount saved by the child as an incentive to child's saving endeavor," said Mr.Sriskandarajah. The main aim of the SED bank is to work for the economic uplift of the northeast people who have suffered immensely due to war, he said. TRO district project officer Mr.Kalaivarnan hands over a savings box to first account holder. Already seven branches of the SED bank are functioning at Puthukuddiruppu, Killinochchi, Mallavi, Udaiyarkaddu, Mulankavil, Mullaitivu town and Maruthankerni in Vadamarachchi east. Muttur Divisional Secretary Mr.A. Nadarajah unveiled the name board of the SED bank. 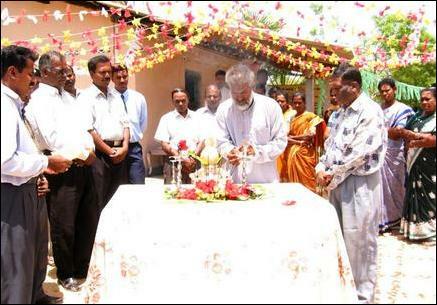 LTTE Trincomalee district political head Mr.S.Tilak lit the traditional oil lamp at the commencement of the event. 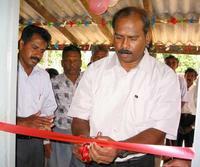 Trincomalee district director of the Tamil Rehabilitation Organization (TRO) Mr.K.Mathavarajah opened the first account. Several parents opened savings accounts in the their children's names, sources said. TRO activist in Trincomalee Mr.Sahul Hameed lighting the traditional oil lamp.